Once Israel crossed the Jordan River, the Lord demonstrates how He is planning to conquer Canaan by the fall of Jericho. However, after that great victory, Israel is so enthused by their seeming success that they try to conquer Ai without consulting the Lord. 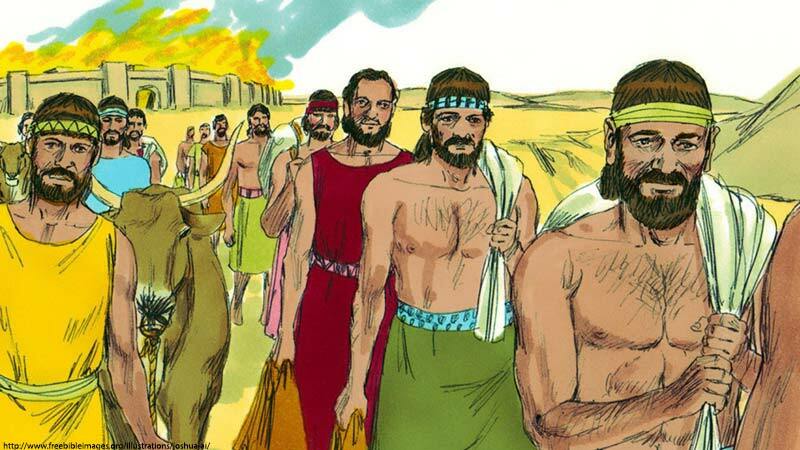 This ends in a very public and embarrassing military defeat, followed by the discovery that Achan has kept for himself some of the forbidden spoil from Jericho, including a very expensive Babylonian garment, and an enormous amount of gold and silver. This is in direct violation of the Lord’s command that everybody and everything was to be totally destroyed, except for the silver, the gold, and the vessels of bronze and iron that are destined for the Lord’s treasury. After Achan and his family are destroyed for robbing God, Israel’s relationship with their Lord is restored, and He tells Joshua to go again to Ai, because this time, it will be given into their hands. They are to destroy the king and the entire population, but can keep the cattle and the spoils as a means of support while they conquer the Promised Land. Joshua is instructed to send a large army to fight and conquer the city. Notice that the divine method of warfare has changed, since Israel has previously chosen to fight, instead of letting the Lord battle for them. From now on they must fight for the conquest of Canaan, even though it is not the Lord’s original plan. The military strategy they’re instructed to use at Ai includes indirect warfare in the form of a pretended retreat and ambush, rather than a prolonged siege or a pitched battle. The Lord’s battle plan is to send a large army the ten or more miles to the city, and when attacked by the men of Ai, they are to feign a retreat and draw their enemies away from their city. Then, the 5,000 men who have hidden in the darkness, ambush the city and destroy it by fire. Just as planned, Israel’s large army appears at the city, and the men of Ai come out to fight. Israel’s army immediately retreats, strongly encouraging their enemies to hotly pursue them, as they’d done before. According to Joshua 8:17, the men of nearby Bethel join them, and once Ai is empty, the ambush soldiers come in and destroy it by fire. Then Joshua instructs his army to turn on their enemies, slaying them in the field and in the wilderness. The king of Ai is probably killed and then hung from a tree, adding to his disgrace. Since Israelite law forbids a dead body from hanging on a tree overnight, it is taken and cast down at the gate of the city, covered by a great heap of stones—a fate similar to Achan’s. Israel achieves a great victory because they follow the Lord. Notice that in Joshua 7:26, Achan is buried under a heap of stones in the Valley of Achor. The word “Achor” means trouble, but in Hosea 2:15, the prophet speaks of the Valley of Achor as “a door of hope.” By following the Lord and trusting in Him, the victory at Ai turns the Valley of Achor into a door of hope. This victory now becomes a symbol of hope.